According to Chute Technology, its new long-life coal chutes and bins eliminate clogging, excessive wear and costly breakdowns in corrosive mining environments. 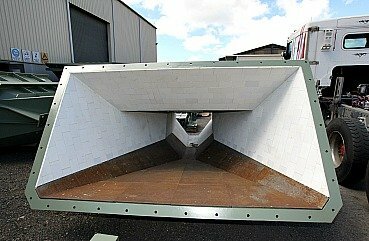 The new minerals processing technology, designed using Discrete Element Modelling (DEM) techniques, uses ceramic tile abrasion linings and replaceable high impact wear elements made from chromium carbide overlays, to reduce maintenance and increase wear life. 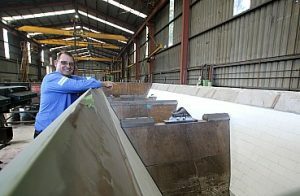 Chute Technology partner Tom Woods says the first examples of the new materials handling technology are already being manufactured for use in a major Hunter Valley mine. Other mines’ problems mirror this site’s issues. “The client there sought a long term solution to clogging, high wear and production interruptions occurring as old chutes were removed, and new ones installed under its rotary breaker and main scalping screens,” explained Woods. Using DEM, Chute Technology says it was able to model and translate into reality a configuration that minimises impact and abrasion zones and smooths the flow of material. The new design eliminates some common impact and abrasion zones, while placing additional impact and wear protection in other zones most subjected to maintenance issues. This article appeared in the March/April 2018 edition of the Australian Bulk Handling Review.